The day was unseasonably warm for January. Endless blue skies. Not a patch of snow in sight. The long afternoon shadows of the bare-branched trees stretched across the ground as I strolled around my neighborhood, soaking up the abundant sunshine. 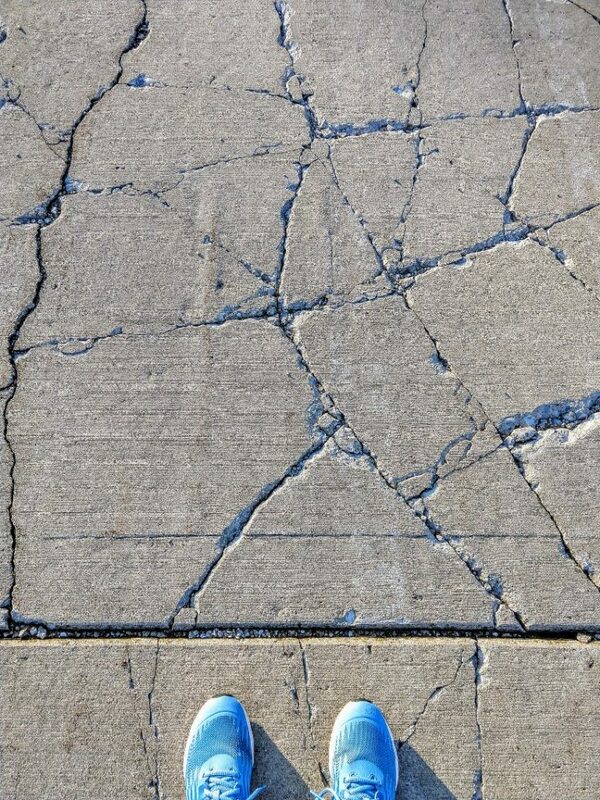 I had passed by this patch of concrete countless times before and never noticed. It should have been uniform like all the sections before and after, but for some reason it was fractured into a mosaic of triangles and trapezoids, held together by a network of crumbling veins and blue-gray shadows. I stood there transfixed by its organic, geometric, chaotic beauty. The Japanese aesthetic of wabi sabi says an object is more beautiful because of its imperfections, not in spite of them. Uniqueness is valued above conformity. Patina over primer. Aging instead of preservation. An object’s flaws reveal how precious it is (nothing lasts), while telling the story of how it is constantly being reshaped by the world around it (nothing is finished). After all, even as we try to prevent it, everything and everyone around us is moving toward disorder (nothing is perfect). perfectly imperfect life we live.